Former WWE World Heavyweight Champion Batista opened up on his decision to have Triple H be his opponent in his final match after having a long and successful pro wrestling career. He joined Lilian Garcia’s podcast where he talked about the call to face Triple H in a No Holds Barred Match at WrestleMania 35 in East Rutherford, NJ at MetLife Stadium. Batista brought up how he felt that his career got started when he worked with Triple H and that he made him a star. Batista recalled Triple H putting a lot of stock and investment in him to the point that he himself on the line physically for him. 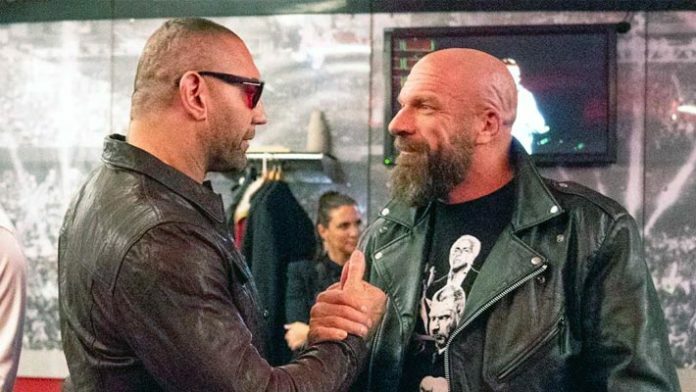 Batista knew that for his last WWE run and his last wrestling match, he wanted it to be with someone he was familiar with and had a backstory with. He also wanted to give back to the company, and he thought Triple H was the perfect person for that.